‘Appification’, or the process whereby web pages are translated into mobile operating systems for ease of access and use on smartphones, has gained momentum in China. As a result , mobile apps have become the main user interface, and have changed the ways in which people consume and businesses sell. According to a notice released by the Cyberspace Administration of China (CAC), all mobile application (“app”) stores in the country are required to register with the government. Effective since January 16, 2017, the notice cites the dangers of illegal information, user rights violation, and security risks that can be spread through mobile apps. By requiring app stores to register with the government, the notice clarifies that legal responsibility for content lies with the app store. This latest attempt by the Chinese government to increase regulatory control over mobile information and services underscores the growing importance of the industry. In 2016, total worldwide downloads from the iOS App Store and Google Play increased by 15 percent, exceeding 90 billion downloads. This same year, smartphone users spent almost 900 billion hours on apps, an increase of 25 percent from 2015. China was largely responsible for this rapid growth, contributing almost 50 percent to the iOS App Store’s annual growth. In the third quarter of 2016 alone, the Chinese market created over US$1.7 billion in iOS revenue. China now leads the market by more than 15 percent over the next largest market, the United States. This command is only expected to widen as internet penetration increases and the Chinese app market continues to mature. The mobile app market in China is highly conducive for growth. Compared to the US or UK, Chinese consumers on average use more apps . According to App Annie, an app intelligence firm, the average Chinese consumer uses an average of almost 40 apps per month, while the average American consumer uses about 35. Chinese consumers now spend five times more in the App Store than they did two years earlier. App Annie predicts that China will have the largest revenue growth of any country by 2020. Games were the most popular downloads in the third quarter of 2016, making up 75 percent of all revenue. However, entertainment and video streaming apps have gained popularity, and mobile shopping apps show great promise. Social networking apps such as Tencent’s QQ messaging app, which saw its largest increase in revenue thus far, also performed well this past year. Android is increasing its share of sales in the Chinese market, while iOS has had a harder time. However, Google Play is blocked in China, allowing for the growth of several domestic firms. 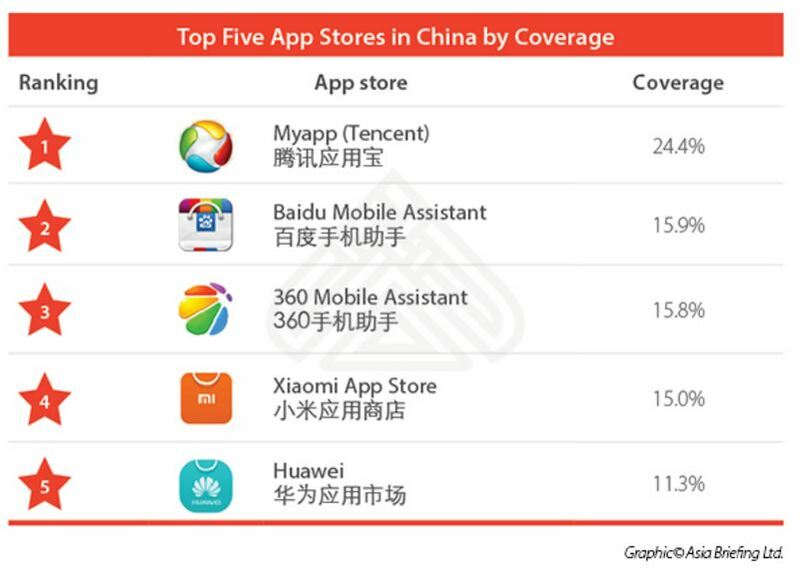 There are over 200 app stores in China, and about 54 percent of all app users go through third party app stores. Large domestic companies, like Tencent, Qihoo 360, and Baidu, have created their own stores, which have performed well. Fragmentation of the market makes government regulation difficult , and leaves the market susceptible to a proliferation of viruses. China is one of the markets most affected by malware infection. According to Cheetah Mobile Security, more than 1.4 million mobile devices were contaminated by viruses as of January 2016. With the CAC notice, the government is signaling its intent to crack down on this issue, but whether it will have much effect still remains to be seen. The growth of China’s mobile app usage and the bright future of the market is attracting app developers from around the world. However, industry competition is fierce, with top international companies targeting the market, and strong performance from local teams as well. Government regulatory oversight is likely to expand and influence the development of the industry, making a clear understanding of China’s idiosyncratic cyber security laws all the more important for foreign entrants.